 During his time at the Geneva Academy, he will be working on state responsibility and complicity in joined military operations (inspired by a Danish High Court decision of June 2018) and on the United Nations (UN) Universal Periodic Review (UPR) process and monitoring of armed conflict situations. He has since 2007 been a member of the Danish National Preventive Mechanism (OPCAT) and has participated in a large number of inspections of prisons and other closed institutions together with the Danish Ombudsman. Furthermore, he is Danish national expert to the UN Subcommittee for the Prevention of Torture, a Danish expert to the Moscow Mechanism of OSCE Office for Democratic Institutions and Human Rights, and alternate member of the Management Board of the European Union Fundamental Rights Agency (FRA). Peter Vedel Kessing is specialized in and has published extensively on security law, armed conflict, counter-terrorism and human rights. He has worked with international human rights projects in several countries in Asia, the Middle East, Europe and Africa since 1997. In addition, he has been Head of the International Law Department at the Danish Reed Cross, worked as a judge in a Danish district court and with international refugee law in the Danish Ministry of Interior, as a member of the Danish Refugee Board; and for the UN High Commissioner for Refugees (UNHCR). He holds a LLM and a PhD from Copenhagen University. He qualified as Professor in international law in June 2017.